The Kroger Game Day Greats Instant Win Game is back. 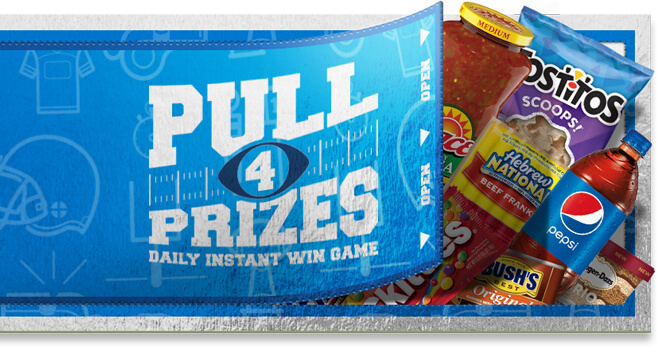 Play the Pull 4 Prizes Daily Instant Win Game at GameDayGreats.com and you could win a prize, instantly. Over 60,000 winners. More than $240,000.00 in prizes. Who Can Enter? The Kroger Game Day Greats Instant Win Game 2018 is offered only to legal residents of the fifty (50) United States (except FL, NY and RI) and the District of Columbia who are at least 18 years old at time of participation. When To Enter? Sweepstakes begins on or about 12:00am (PT) December 24, 2017 and ends on or about 11:59pm (PT) February 2, 2018. What Is The Game Day Greats Instant Win Game Prize? The Grand Prize consists of a digital coupon loaded to winners’ Shopper’s Card.